Photograph: Martha Williams Golden boar cocktail at Cindy's Bar. El top: Red to Monroe. Ever since Cindy's has opened it has become a staple to take visiting friends and family. The view is one of the best in the city for a rooftop - you can oversee Millennium Park and the Bean - and the food is also to die for. The drinks are unique and the decor exudes fresh, friendly and relaxed. Sometimes there can be a long wait, but it's always worth it. It can also make for a cute date night as well! I know this comment will be ill-received but.... I just don't get the hype about Cindys. The drinks are pricey and w-e-a-k. The views are great, yes- I am right there with you BUT will you stay the 3 hours to reach the edge of the balcony? Maybe. Will you get a table near the balcony? I highly highly doubt it. If you've got the time and the money, try it out but I would much rather go to one of the 100s of other rooftops in the city. 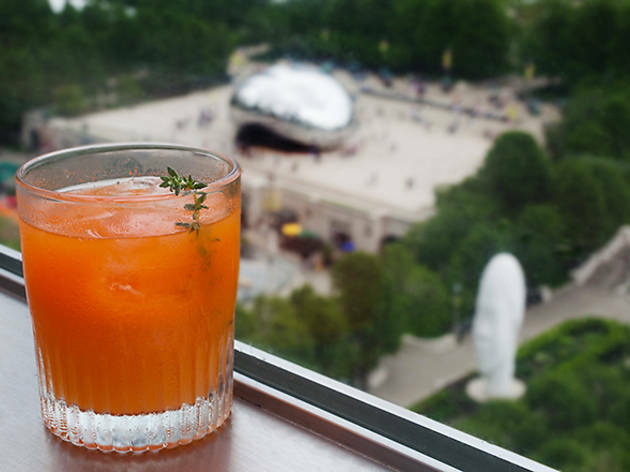 Chicago doesn't get much better than this rooftop bar. Cindy's offers an upscale setting for the breathtaking panoramic views from it's terrace which overlooks Lake Michigan, as well as Millennium Park to name a view. I have never had the pleasure of gorging on the fantastic food on offer but as a way to see Chicago from the sky while enjoying an old fashioned, it really is a must. Don't fret if it's a bit chilly outside, there is a huge fire pit where you can warm yourself while striking up a conversation with other touristy or local folk. A must see for anyone new to town and wants a good lie of the land in Downtown Chicago. Great views and great atmosphere along with great drinks and great, friendly bartenders. A rooftop gem that is unpretentious for an upscale bar of its caliber. Beautiful food and atmosphere! Love Cindy's in the evening for a city view, incredible cocktail and delicious food to share with family! The food, the view, and the cocktails!! Amazing!! Cindy's has one of the best views in the city. I really love going up there to sit on their outside deck and just look at the lake/city. The drinks are pretty pricey but you pay for the view and the great atmosphere. i took my boyfriend there for his birthday and we had a great time. I love Cindy's because of the amazing view. If you get there early you can snag a seat around the fireplace out on the terrance. They're cocktails are amazing but can really start to add up if you stay for a few! Cindy’s has undoubtedly one of the best views in in the city. Located just above the Chicago Athletic Association it overlooks the amazing pavilion in Grant Park. Its perfectly located if you work in the loop and want to grab drinks after work, plus if there is a wait time you can head down to Chicago Athletic Association for a drink. Cindy's is one of those bars you can and should take nearly anyone who's new to Chicago. Perfect for all (drinking) ages, the views are great, especially when the weather's a bit chilly and you can sit by the fire pits at night with a drink and a few friends or family members. Have to confess I don't remember A LOT from my first time at Cindy's, except that a) it was a good time...b) the drinks were good and fiendishly strong and c) it had views of the Bean (which, as a tourist, I am still very much in love with). Cindy's, how do I love thee? Let me count the ways. I love the views you offer of our beautiful city. I love the patio and the fire pits to keep guests warm when the weather drops. I love the cocktails. I love the skylights that make you feel like you're outside even when you can't be. I had the chance to enjoy drinks with an incredible view after a day at Lollapalooza. The view of the Lake and Millennium Park are incredible from the small outdoor terrace. The Chicago Athletic Association Hotel is first class and Cindy's is no different. Grab a cocktail and enjoy the incredible view! Best view in Chicago? It's definitely the only thing like it on Michigan Avenue. You might have to stand in line to get up to the bar (and you might wait some more AT the bar, but hey, good drinks take time), but the line always seems to move fast, and it's worth the wait. 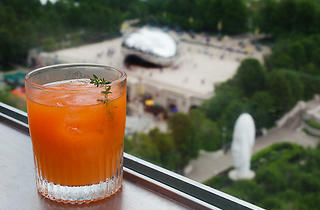 Awesome cocktails and a view of Millennium Park and the lake.